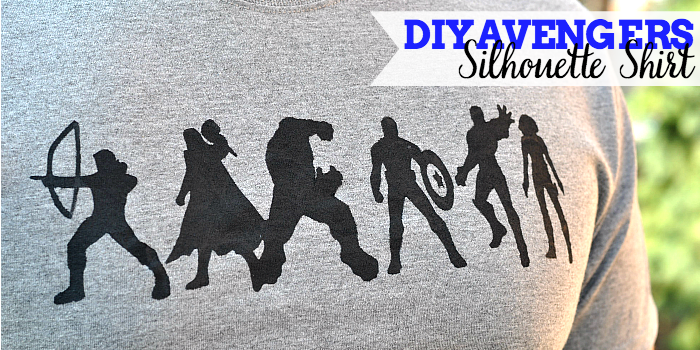 Avengers Week continues with this DIY Avengers Shirt! 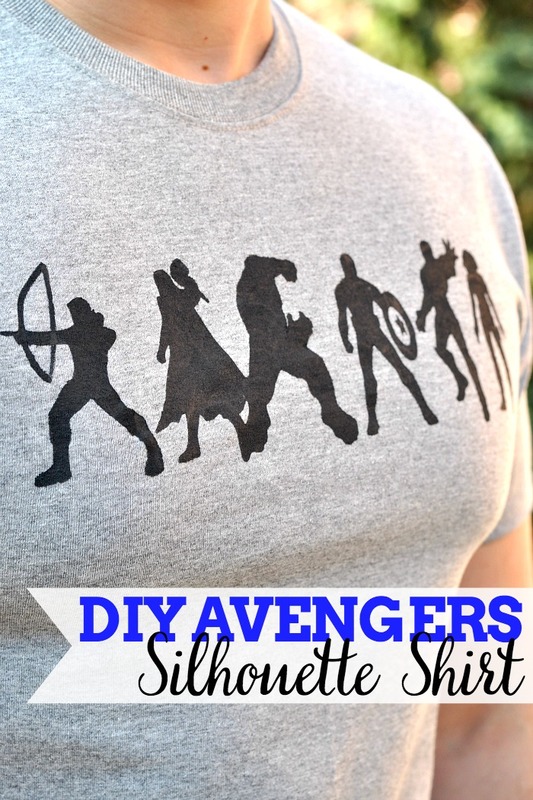 How could I let Avengers Week pass without making Bryan a fun DIY Avengers Shirt for him to wear to the premier?! But let me be clear about this – I did not spend hours on this shirt. This week has been incredibly busy so if I wanted to make him something, it had to be easy. Really easy. 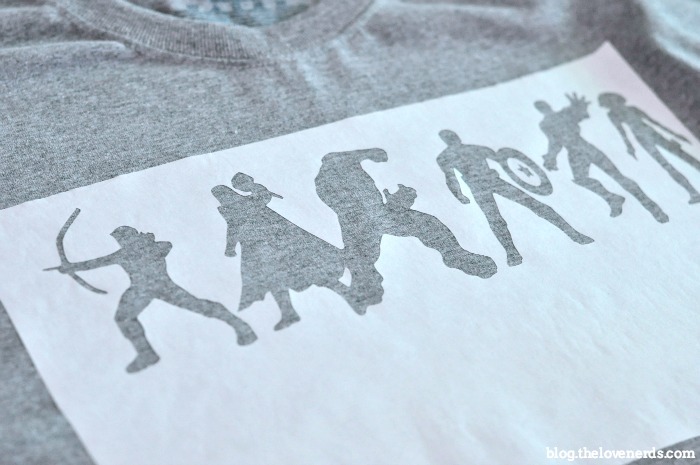 Enter this Avengers Silhouette shirt. Now, it might look hard, but the process is actually pretty simple. The most amount of time will be spent on preparing your stencil. If you have a craft machine, like a Silhouette or a Cricut, it is much faster than if you need to hand cut your stencil. Keep this in mind! 1. Cut out your design onto the Freezer Paper. Keep in mind that you will be ironing on the design shiny side down onto the fabric. If you use a different design in the future and it’s symmetrical, it doesn’t matter which direction you cut out your design. It’s the same either way. However, if you design is not symmetrical like the Avengers Silhouettes, you will need to think about what the design looks like with shiny side down. When using my Silhouette, the matte side of the freezer paper must face down onto your mat (otherwise the shiny side would slip around), so I have to flip my design horizontally when I cut it out. 2. Remove the access of the design and iron the freezer paper stencil onto the fabric shiny side down. Make sure the iron is set to no steam. If you have any small pieces (for example like I did with the Cap Shield and the empty space between Thor and Hulk), Iron those on after you get the large design ironed on. It is easier to concentrate on just one small little piece at a time. 3. 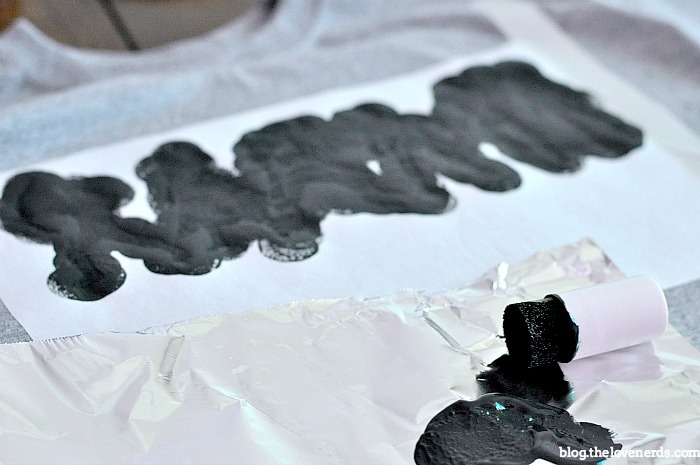 Put a piece of cardboard inside the shirt and then use a paint sponge to apply fabric paint onto the shirt. Make sure you put on a good amount of paint evenly over the design. 4. Let the paint dry for at least an hour and then peel off the stencil. At the time, you might want to do a couple small touch ups with a paint brush but those are pretty minimal. 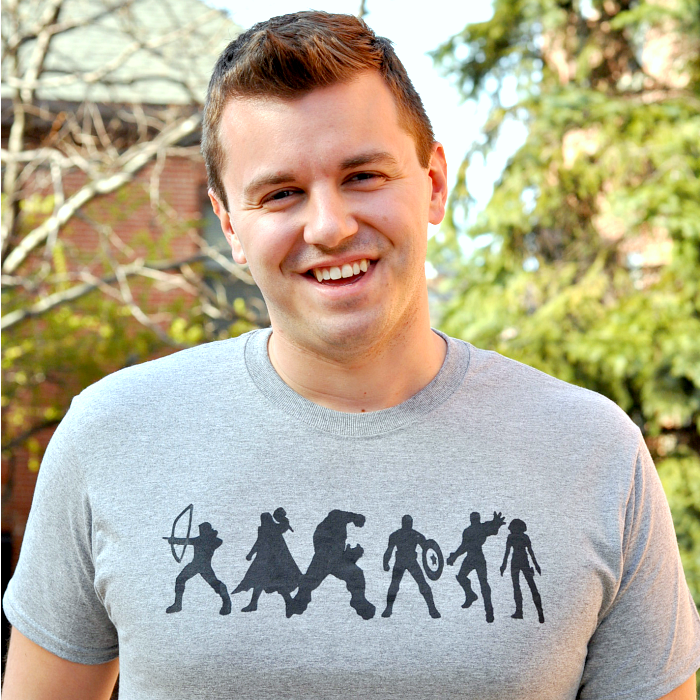 For this shirt, I just went with a paint brush to add the string to Hawkeye’s bow that was not seen in the silhouette design. If I was calculating time for the project – NOT including the creation of the design, I would say the whole process took around 20 minutes. If I couldn’t cut out the design with the Silhouette Cameo, it would have taken longer. Here is your free version of the Avengers Silhouettes! I will say that this is not a super clean design digitally. It is meant as a stencil and as a guide – not print quality!